Sometimes I have a hard time finding a movie or game I really like because I love action and suspense, but despise horror/gore/mutilation/etc. I was (unfortunately) the one to review Layers of Fear a while ago from Bloober Team to find they are immensely good at freaking me out. I did my best to review the game, but it ended up getting what I called the "NOPE" award, wherein I skedaddled right out of the game and reviewed it as best I could. I could tell horror nuts would love it, but it wasn't for me. I could tell Bloober Team was good at their craft, but I wished they could tweak that full-on horror into less of a scare and more of a thrill. 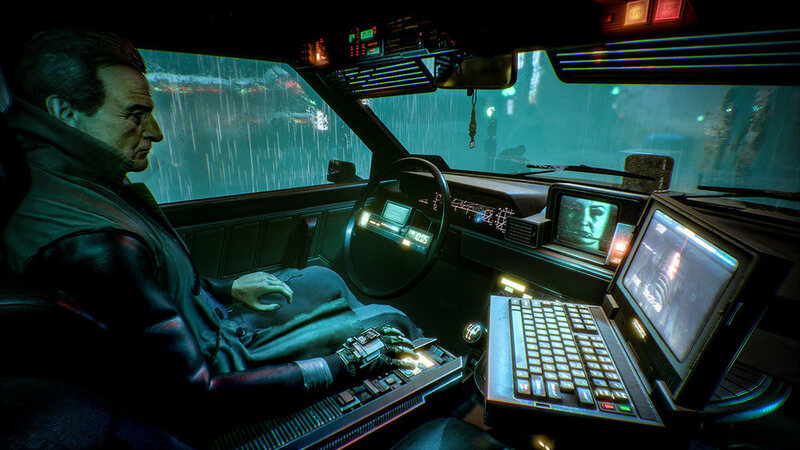 Whilst >observer_ might still be a little too freaky for my tastes, it creates more of a cyberpunk storyline that draws me in and makes me want to figure out what the heck is going on with a hope for a future instead of Layers of Fear's constant spiral descent into madness. >observer_ tells the tale of Daniel Lazarski, a special "observer" who begins the tale looking for his son. He hasn't seen him for a while, and when the investigation leads into a seedy neighborhod apartment complex and an unidentifiable body, Lazarski hopes that it isn't his son he found as he investigates the murder and continues his search. Observers have special abilities and augmentations that allow them to "jack in" to suspects and witnesses to learn information they can't (or won't) divulge, resulting in some surreal and creepy scenarios. The game relies heavily on tropes of the genre made well known in movies like The Matrix and Blade Runner. Lazarski himself is played by Rutger Hauer, famous from Blade Runner and other dark, gritty stories. Humans are mechanically augmented, and there is a critical virus going around that attacks people with augmentations. The world is coated with neon and digital design. Lazarski has the ability to alter his vision to observe physical evidence and a tech scanner that helps him figure out puzzles. Each of these add an electronic overlay to the graphics, and your field of vision gets digitally blurry when Lazarski appears to need some of the medications that keep him going. Let it go long enough, and the graphical glitches start covering up even your base menu options. The Switch edition of the game suffers from a bit of a downgrade, as screenshots of the PC or other console editions do look much prettier, but you do benefit from the portability of the title. One of my biggest complaints, however, is in the portability. When playing a haunting thriller such as this, you really should set the mood. Most home theaters are in a place where you can curl up with a good sound system, darken the room, and live the game. >observer_'s graphical downgrade isn't much, but it still makes things overall harder to see on the small screen. Hauer's voice is raspy and gravelly which can be hard to hear when you aren't on headphones and trying to keep the game quiet. The dark tones make the screen harder to see if you're, say, playing outside in the sun or in a car. In handheld, it works great bundled up in your covers with the lights out, but is hard to recommend in any other situation. The biggest issue though is the file size. While my research shows >observer_ clocks in at 8-9 GB on Xbox One and PS4 (where they are paltry in comparison to AAA games), it eats up 3/4 of your internal memory at 18 GB (for me, that's 5 GB over my next largest game and 10 over my third). The Switch does hold some advantages though. In handheld mode, files and selections can be made naturally with the touchscreen. The best addition is smart use of HD rumble. You feel everything, and it really shows off Nintendo's new technology. If you aren't totally worried about perfect graphics, the specialized rumble really adds to the atmosphere. I will also add that the game (for the most part) is a slow burn. Horror tends to be a slow burn until a big scare, and cyberpunk isn't known for constant fast pace either. A particular character you meet early in the game and interact with frequently speaks very slow with several pauses. It wouldn't be as bad if it weren't for the default subtitles that you can read in the quarter of the time it takes for him to speak. I'd also question how most everyone at the beginning peeks at you through a virtual peephole rather than cracking their door or such. It makes for an atmosphere, but once I spent five minutes searching because I'd managed to activate a doorbell but had no idea who was talking to me. Bloober Team does an excellent job of putting the scare into a game. This completely turned me off of Layers of Fear, but mixing it with other genres has drawn me in. >observer_ is more of a constant state of wonder and tension, with some well placed jumps to keep you on edge. I admittedly haven't gotten all the way through the title, but can say that the atmosphere draws you in and makes me want to see it through to the end. Unfortunately, if I'm going to download anything else Lazarski may have to be put on hold to make room until I can get a bigger memory card. Hopefully they will eventually be able to optimize the game a bit more to trim the fat from the bloated file size compared to the game on other systems. Thanks a lot to Bloober Team for providing a code for >observer_ for review!